The Central Park Conservancy unveiled its new ramp at the Arsenal building. CENTRAL PARK — A staircase leading 10 feet down to Central Park's landmarked Arsenal building has caused difficulty for parents with strollers and for those in wheelchairs, but a new ramp officially unveiled this week will finally give access to everyone, according to the Central Park Conservancy. There has been no ramp from Fifth Avenue to get into the building, which houses the city's Department of Parks & Recreation, the Arsenal Gallery, the City Parks Foundation, the Historic House Trust and the New York Wildlife Conservation Society. On Tuesday morning, the Central Park Conservancy officially unveiled the new ramp and upgraded staircase which was constructed over the summer. “Since the day Central Park was built, people with and without disabilities have struggled to get down the steps to access the park’s headquarters at 64th Street and Fifth Avenue” said Victor Calise, the Commissioner of the Mayor's Office for People with Disabilities. “Now those days are over." 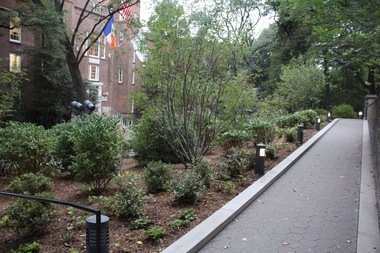 The ADA compliant ramp, which starts at the East 64th Street entrance to the park, will also provide additional access to those going in and out of the Central Park Zoo located behind the Arsenal, according to Elizabeth Kaledin, a spokeswoman for the Conservancy. New lighting was installed along the ramp as well and the new handrails have be installed to the existing stairs, she said. "We are always looking to improve and make Central Park as accessible as possible given the fact that it’s a park and will always have some challenging topography," she said. "The Arsenal was a priority because it is such a heavily used entrance and was atypical given the staircase leading down to the park." The cost of the installation was donated by Marty and Michele Cohen. The Arsenal was built in the mid-1800s by the New York State as a place to store munitions and was designed to look like a medieval fortress. Since then it has held many different functions including office space, art galleries, and was even the first home for the American Museum of Natural History before it built its current building on Central Park West. In 1967, the Arsenal was designated as a New York City Landmark.